After the enthusiastic reception at New York’s Waldorf Astoria Hotel on June 23 1919, Eamon de Valera was deluged with invitations. For the next 18 months he kept the cause of Ireland before the American public. Criss-crossing the country he addressed public meetings, and state legislatures, receiving on the way a plethora of honorary doctorates, including being adopted as a chief of the Indian Chippewa nation. He quickly won the goodwill of William Randolph Hearst and his chain of newspapers. He was given maximum publicity wherever he appeared, which proved to be an effective answer to British propaganda. But almost immediately Dev collided head on with the opposition and resentment of the once powerful Fenian lobby led by John Devoy and Judge Daniel F Cohalan. Devoy and Cohalan wanted to retain control of all monies raised in America. Surrendering that power gave De Valera the status of a great Irish champion which they had held and enjoyed until his arrival. They had effectively pushed Liam Mellows out of the Fenian movement. They felt that his campaigns to buy arms from Germany, and to stop Irish Americans joining the army to fight for Britain on the battlefields of France, had overshadowed the years of sweat and toil they had put into the Irish cause. Alarm bells must have seriously rung for Dev when Harry Boland told him that when one million dollars was raised in Philadelphia, the chairman of the Irish Victory Fund, who happened to be Judge Cohalan, insisted that a vote be passed demanding, with the exception of $250,000, the rest of the money would be kept by the organisation for ‘educational propaganda in America’. Dev moved quickly. He set up an alternative fundraising organisation, which would be answerable to the Dáil in Dublin, and not to the Fenian movements long established in America. The cumbersome sounding American Association for the Recognition of the Irish Republic, clearly identified where the money was going. It not only attracted large funding but young Irish Americans deserted the old Fenians to join Dev’s association in droves. By the end of 1919 it had half a million members, which was to rise to 700,000 by December 1920. The money poured in. By the time Dev was ready to return to Ireland he had collected more than $5,500,0000 - an impressive sum for the time. De Valera’s time in America, however, was a triumph of sorts. He had stayed longer that he had anticipated. Events now in Ireland were demanding his attention. Yes, the Irish Republic had yet to be officially recognised by the American government, but he had raised considerable funds, and must have been heartened by the rousing receptions, and magnificent ovations that he received, which showed how much sympathy the American people felt for Ireland’s cause. Liam Mellows, however, had already returned to Ireland the previous October. In contrast to Dev’s feelings, he had little love for America. He had been harshly treated by the Fenian movement. He had been sick and, on one occasion, had actually starved. He wrote that he was ‘very glad to have shaken forever (I hope ) the dust of the soul-less place off my feet’. Next week: Mellow’s disillusionment with the 1916 Rising leadership; his opposition to the Treaty. NOTES: * A young Irish girl from Cahirdaniel, Co Kerry, was taken on as a typist. She was Kathleen O’Connell, who was to be Dev’s faithful personal secretary for 37 years until her death in 1956. **Devoy paid a final visit to Ireland in July 1924. He was greeted by the Cumann na nGaedheal government as an elder statesman. It was probably pleased he disliked de Valera as much as did the Irish government. Despite his welcome Devoy later expressed suspicion of its ‘imperialist policies’. It is unlikely Devoy met de Valera on that occasion. 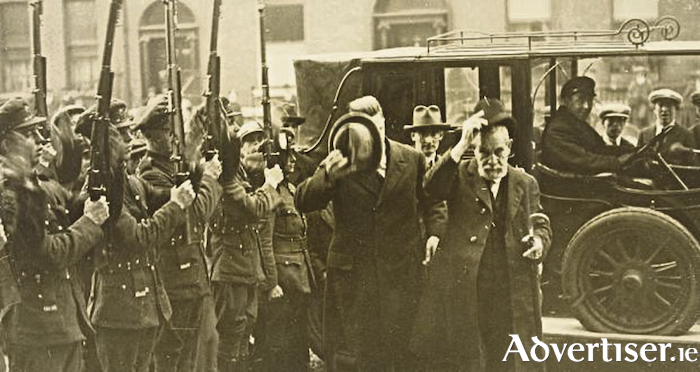 At first Devoy opposed the Anglo-Irish Treaty (December 1921 ) because he thought Dev supported it. When he heard that Dev was against it, Devoy came out in support. He died four years later at Atlantic City aged 84. His body was returned to Ireland and is buried at Glasnevin cemetery. Sources include: Eamon de Valera by Earl of Longford and TP O’Neill, Dictionary of Irish Biography, and Conor McNamara’s War and Revolution - In the West of Ireland, on sale 17 euro.